Kyle MacLachlan is known for his darker roles in films and television shows such as Blue Velvet, Twin Peaks, and Calvin Zabo (aka Mister Hyde) in Marvel’s Agents of S.H.I.E.L.D. However in Pixar’s INSIDE OUT, MacLachlan’s just Dad, and as father to 7 year old son Callum, MacLachlan’s perfectly happy playing the dad. During our recent press trip to Pixar Studios, we had the opportunity to sit down with Kyle MacLachlan and Kaitlyn Dias – the voices of Dad and Riley from Disney•Pixar’s INSIDE OUT. (L-R): Riley Andersen and Riley’s Dad. ©2015 Disney•Pixar. All Rights Reserved. The “dad” in Kyle MacLachlan was showing during our interview as he acted paternalistic (in a good way, not the obsessive Cal from S.H.I.E.L.D. way) towards the 16 year old Kaitlyn Dias making sure she had plenty of questions and opportunities to answer. They started with how they were drawn into the film and voice-acting differently. “When Pixar calls, it’s hard to say no” said MacLachlan; while Dias was originally brought on as a scratch (or test) voice for the film. When Kaitlyn found out they wanted to keep her voice in the movie, “it really blew my mind,” she said. Anger, Fear, Joy, Sadness and Disgust look out upon Riley’s Islands of Personality. ©2015 Disney•Pixar. All Rights Reserved. (L-R): Riley’s Dad, Riley Andersen and Riley’s Mom. ©2015 Disney•Pixar. All Rights Reserved. 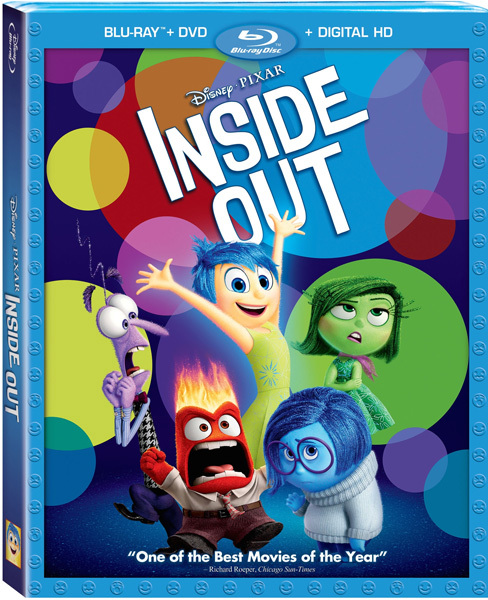 The INSIDE OUT home edition includes an extensive line-up of bonus features including deleted scenes (click here for an exclusive look), the theatrical short film LAVA and “Riley’s First Date?” short. We also chatted with the voices behind the breakout stars of the film, Sadness and Bing Bong. Click here for our conversation with Phyllis Smith and Richard Kind, and follow this link to catch the “Train of Thought” and read our full review of Disney•Pixar’s INSIDE OUT.